Feature: are games killing us? If Walker’s easily prone to tears, my own emotional foible is being governed by extreme worry. Paranoia, even. This may be evident by the occasional panic in this feature I wrote a while back for PC Gamer UK, which has just been lobbed online. ‘Are Games Killing Us?’ is the question it poses. “Yes, but slowly and horribly” is the reasonably inevitable answer. For a good couple of weeks as and after I researched this piece, I couldn’t sit at a PC for more than ten minutes without having to stand up and nervously pace about the room, until the imagined leaden feeling in my legs that definitely, definitely meant I was doing to die of Deep-Vein Thrombosis subsided. 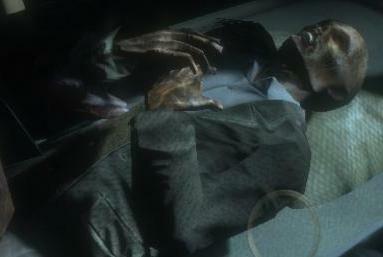 By way of illustration, here is a picture of a dead man in a game. 1) Currently absent from this online version are the boxouts about how to stop yourself suffering these terrible fates, both by living better and -woo – by playing the right games. They’re an important counter-balance to the worrying of the main feature, and you can read ’em by buying the current issue of PC Gamer. They’ve got advice in by people who, unlike me, understand how the human body works. 2) PCG specifically requested it kicked off with the tale of That Korean Guy Who Died In A LAN Cafe. They’ve got a lot of good reasons for it, which I respect entirely. It’s just that, if I’d been publishing the piece, say, here, I’d probably have started off on a pretty different tack. Finally, if it seems to be coming on a little strong, well, there’s a reason for that. We’re the first generation that’s really living in this way, and until the genuine physical effects of it in the long-term are firmly established, I’d say us pathetic creatures of meat and bone really should play it safe. The PC Gamer online / CVG / Games Radar oddness continues, with a Devil’s Advocate I wrote for PC Gamer on mouse versus gamepad chucked up on CVG. But not on PC Gamer. So, released solely to an audience not familiar with the tongue-in-cheek concept of this Gamer regular (the clue’s in the name), the guys in the comments thread, completely oblivious that I’m screwing with them, are pretty hilarious in their outrage. My only real concern is that it’s up on CVG because someone there thought it was a serious discussion of the issue. It’s really not.